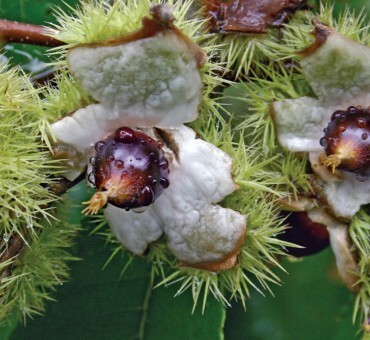 Currently in production for October of 2019.Shrub species of chestnut found throughout eastern North America from Florida to Maine. Chinquapin is rarely cultivated to any extent partly due to propagation issues with the highly perishable seeds. We have solved this issue and now can offer it in quantity, plus all plants are grown in pots giving it the best chance in transplanting. 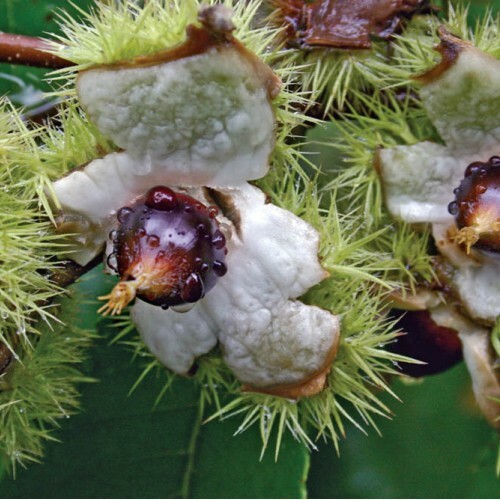 Note: This species flowers earlier than other chestnuts so make sure you have two chinquapins for fruit set as it does not cross with other chestnuts (always comes true from seed). Another great aspect of this shrub is its low height reaching only 5-7 ft. with the small acorn shaped nuts stuck on the outside of the husk making harvesting very easy. The sweet nuts ripen in late August and begin producing on small trees usually 2-4 years after planting. There is some interest about commercializing this species and growing it like hazelnuts in orchards. Our strain originally came from an Ohio grower who commented although not blight immune these shrubs are resistant enough to produce nuts in spite of the blight. That has been our experience as well. We have had very good production here in southern Michigan. For maintaining health of the chinquapin, older branches should be removed when they become weak or unproductive after 10 years or so and should be cut to the ground. New sprouts from the base of the plant will then replace less vigorous branches. No shipment to CA, OR, WA.